Blueberry Lemon Bread is easy to make, super moist and bursting with fresh blueberries and refreshing lemon flavor. 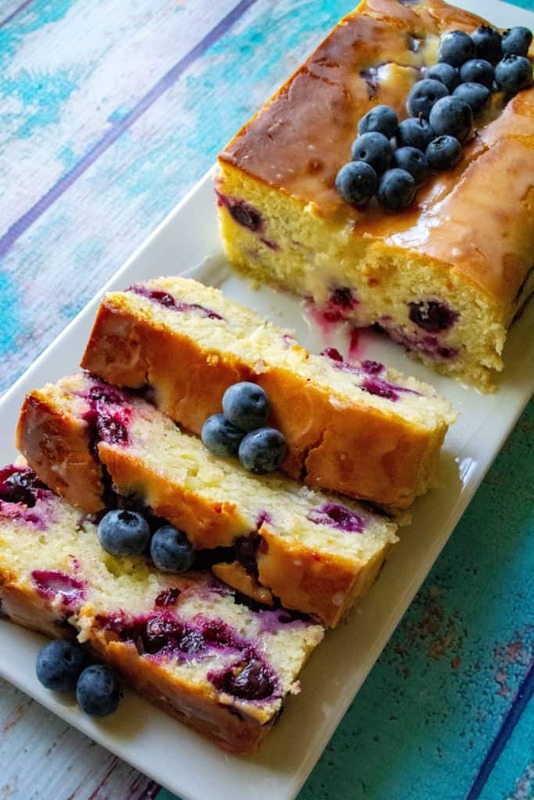 Topped off with a tangy lemon glaze, this Blueberry Lemon Bread is pefect for both breakfast and dessert! 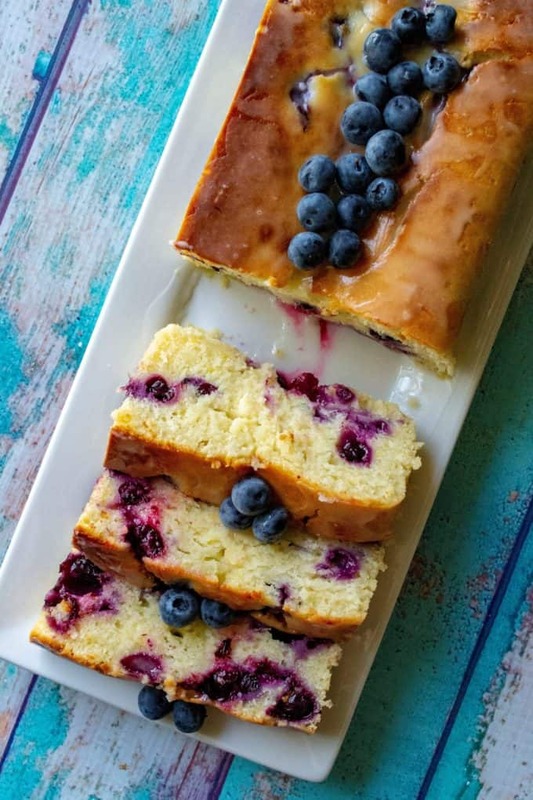 When it comes to my favorite springtime recipe, this Blueberry Lemon Bread is my #1 top choice. 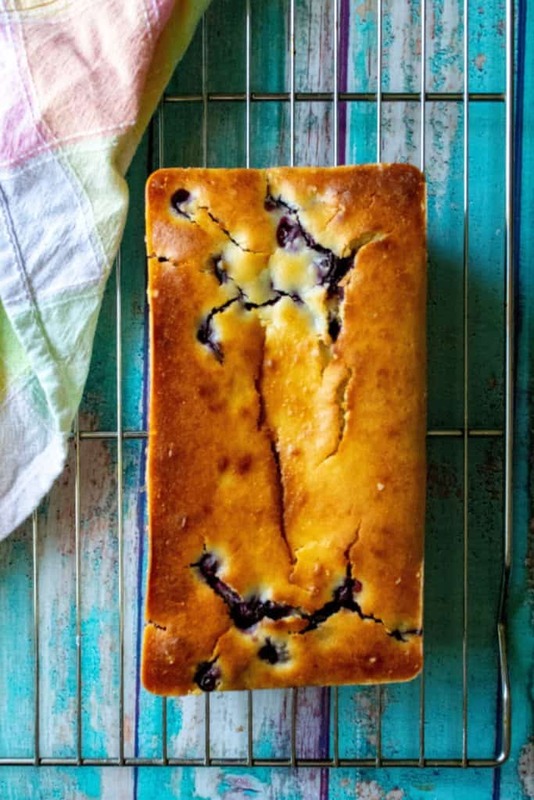 Who doesn’t love when the weather warms up and spring is in there air and the house is filled with a-ma-zing lemon and blueberry scents wafting through the air while this Blueberry Lemon Bread is baking in the oven? Yup … I actually said ‘wafting’.. and it fits because trust me, my house smells soooo good right now! 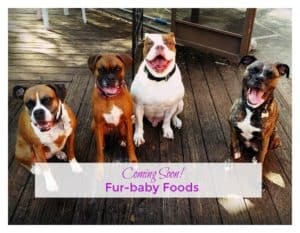 After months of eating out of a slow cooker and indulging in heavy comfort foods, it feels good to change lanes and make something …. springy! 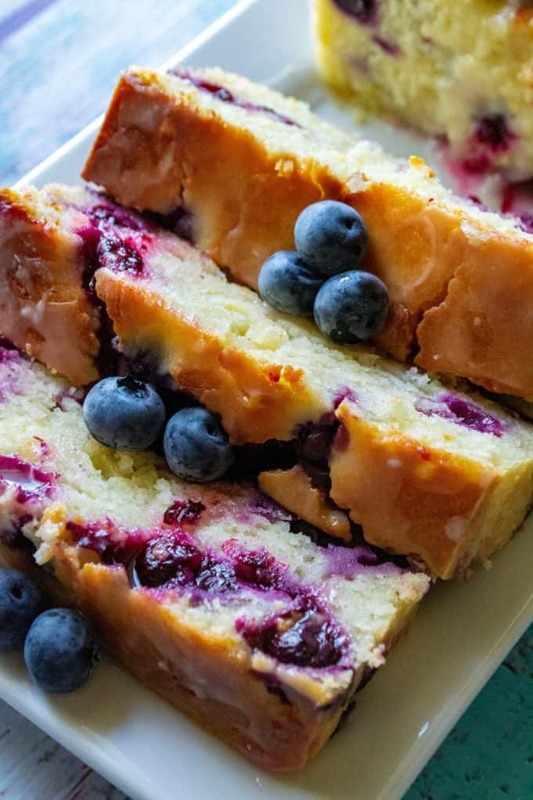 This Blueberry Lemon Bread is the perfect embodiment of springtime. This lemon blueberry loaf is super moist, packed with refreshing lemon flavor, tons of little plump blueberries and let’s take a minute to chat about the lemon glaze. 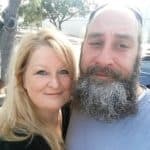 Ooof!!! .. the lemon glaze that is drizzled on this lemon bread is ridiculous in that it has just the right amount of tartness and sweetness combined. 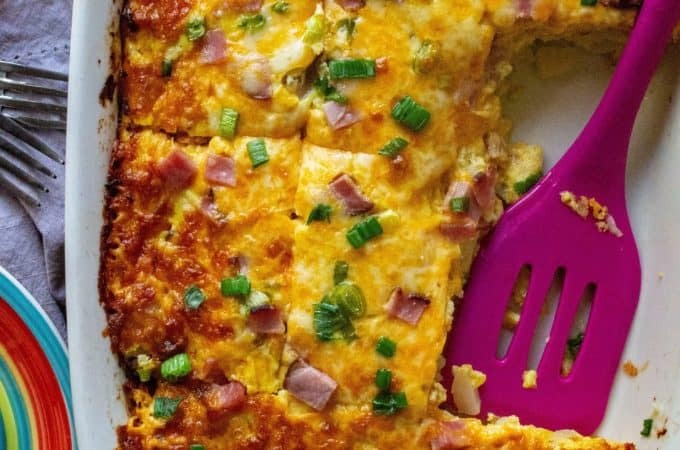 Serve this up with a cup of coffee and the option for seconds and you have the perfect plate of lemon blueberry happiness. This recipe for Blueberry Lemon Bread calls for lemon zest. What is lemon yest, you ask? 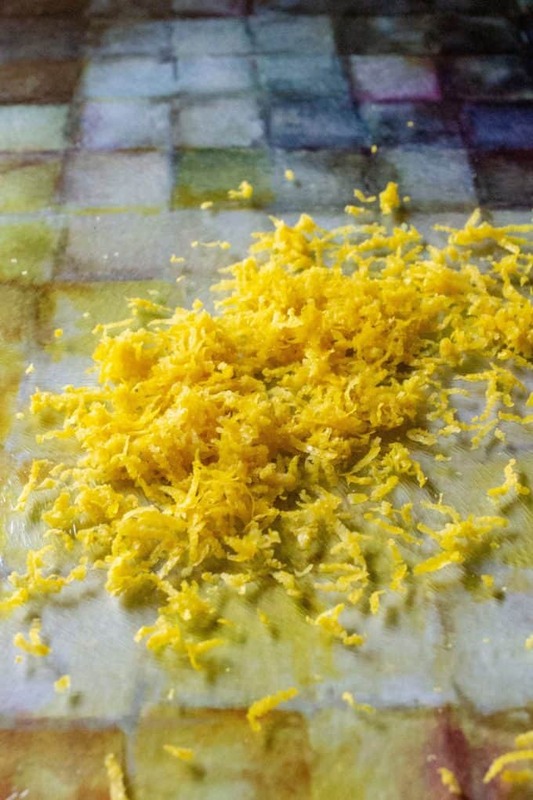 Lemon zest is the outmost rind of the lemon, the yellow layer on the outside of the fruit. 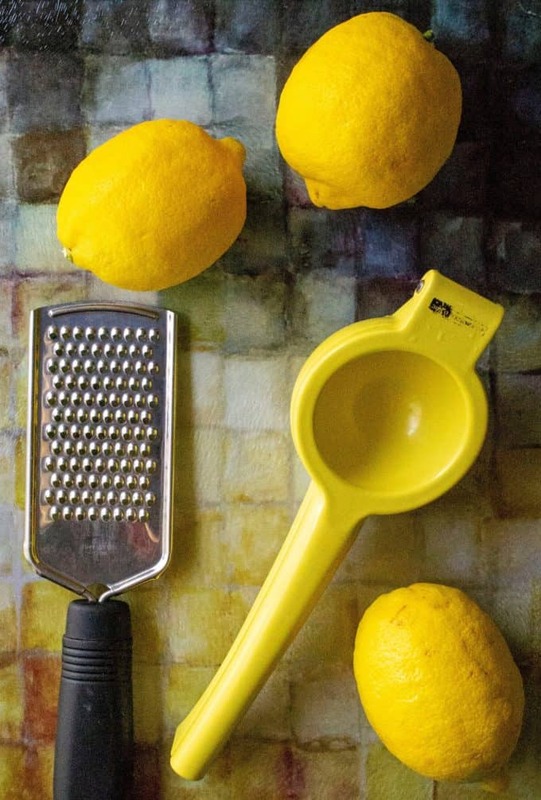 It’s most loved for the strong lemon flavor it brings to food due to the aromatic oils in the rind. While not necessarily to make this Blueberry Lemon Bread, there are a few kitchen tools that I simply cannot live without and they both happen to make this recipe quicker and easier to make. First is this handy dandy fruit juice squeezer. I am sure that is not the technical name for this gadget but it’s basically what it does. Simply cut your fruit (lemon, in this case) in half and place it upside down in the cavity, bring the top and bottom together and squeeze. Squeezing juice from a fruit has never been so easy. Next is my zester. 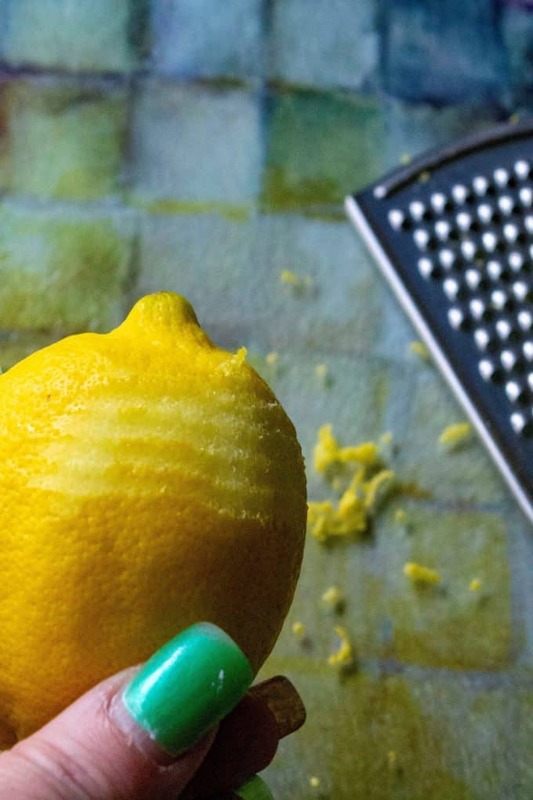 This is a handheld utensil that is great for zesting fruit and even hard cheeses like parmesan. Love, love, love both of these and use them all the time! 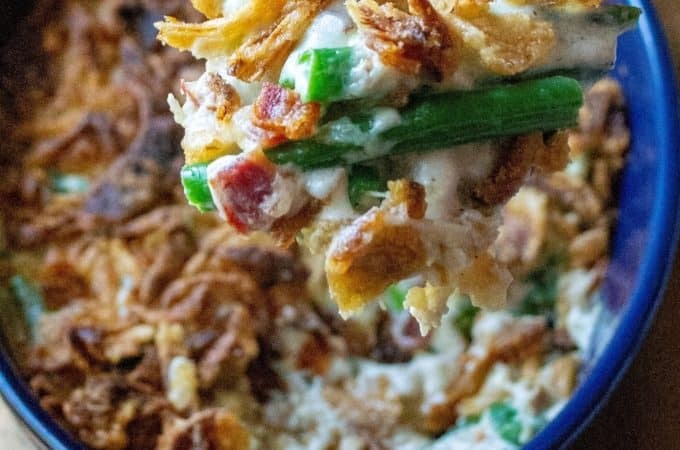 If you don’t have sour cream, you can substitute it with Greek yogurt if it saves you a trip to the grocery store. This Blueberry Lemon Bread recipe would also work great using raspberries or blackberries, if you prefer. You can also substitute frozen berries if fresh are unavailable. The lemon glaze is a sweet, tart glaze but it can be left off if you prefer a less sweet treat. 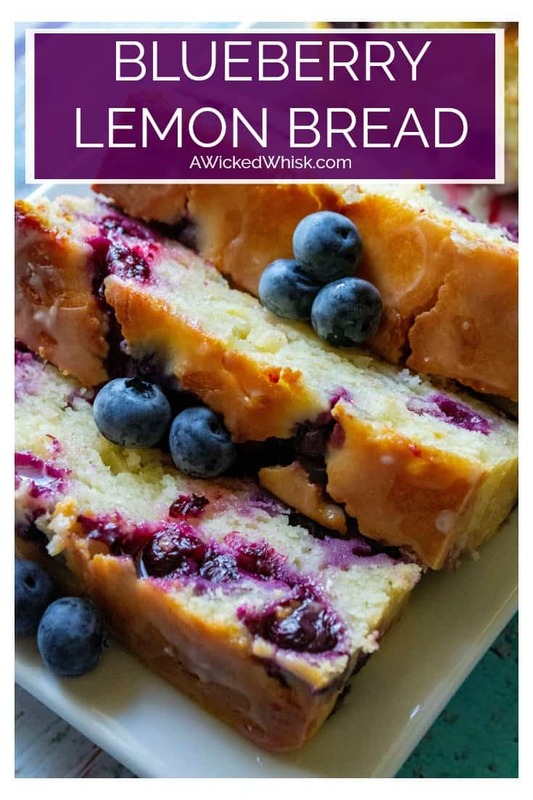 HOW DO YOU MAKE BLUEBERRY LEMON BREAD? Easy! To make this Blueberry Lemon Bread, preheat your oven to 375 degrees, butter the bottoms and sides of a 9×5 loaf pan and set it aside. Next, add your oil, sugar, eggs, sour cream, lemon and lemon zest to a large mixing bowl and mix together. Add in your flour, baking powder and salt and mix to just combine your ingredients. Once your batter is together, add 1-1/2 cups fresh blueberries to bowl and toss them with 2 teaspoons of flour. 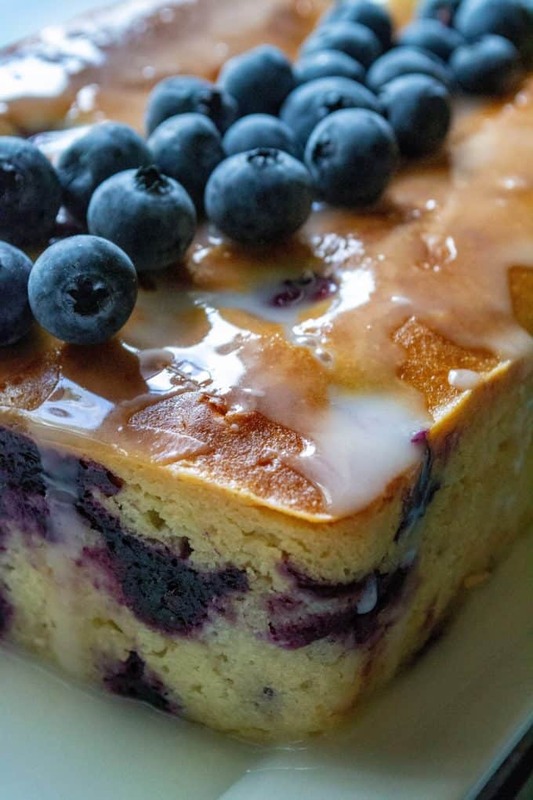 Add your tossed blueberries to your lemon bread batter and gently fold them into the batter. Pour your batter into your loaf pan and bake for 60-65 minutes or until you insert a toothpick into the middle and it comes out clean. 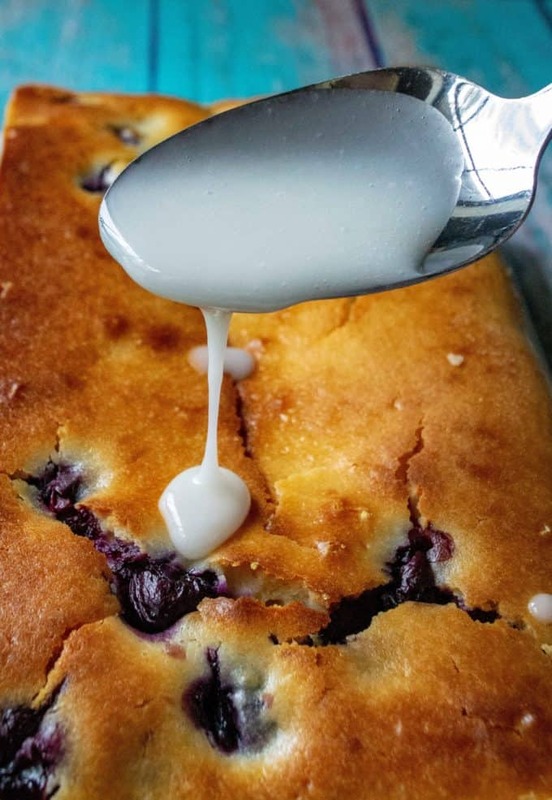 Remove your Blueberry Lemon Bread from the oven and let cool in the loaf pan for 20-30 minutes. Run a sharp knife around the edges of the inside of the pan and invert your loaf onto a cutting board or plate and then flip again onto a wire rack where it can completely cool. Once your Blueberry Lemon Bread had completely cooled, add sifted powdered sugar and lemon juice to mixing bowl and whisk to combine. Add more juice to your glaze to thin it out or more powdered sugar to thicken it up depending on preference. Using a spoon, drizzle your glaze over your bread loaf 5-10 minutes before serving and garnish with remaining 1/2 cup fresh blueberries. Be sure not to overmix your Blueberry Lemon Bread ingredients. You want to just combine the wet and dry ingredients so they are incorporated without beating the heck out of the batter. Overmixing the batter will give you a denser bread. I prefer using oil instead of butter since oil gives you a very moist lemon bread. 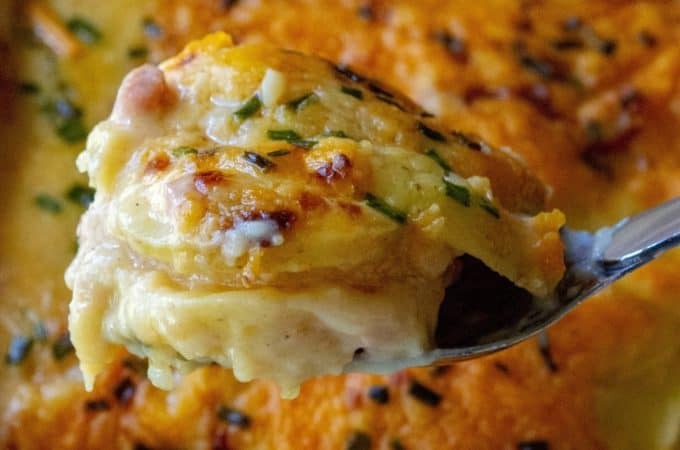 Butter is great for adding extra flavor but the oil will give you a moister baked good. 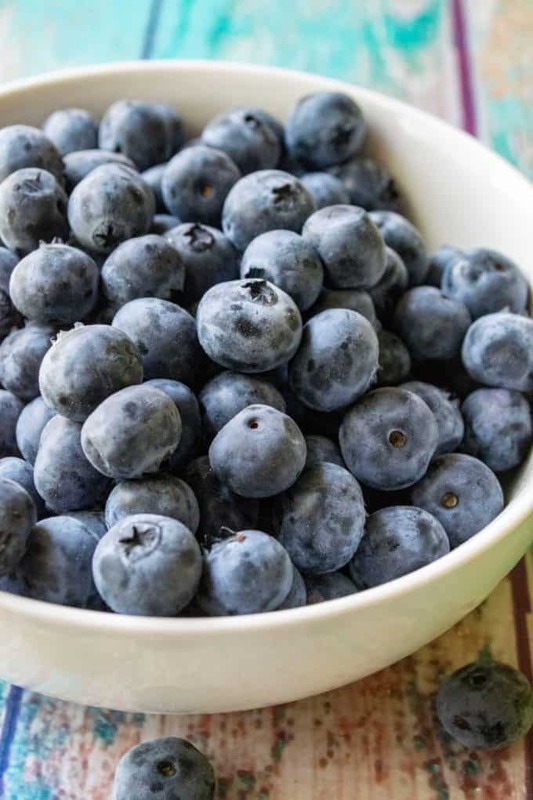 Be sure to inspect your blueberries before tossing them in the flour and adding them to your batter. Pick out any blueberries that are broken or damaged. Speaking of the blueberries, don’t forget to toss them in a couple teaspoons of flour before folding them into your lemon bread batter. Tossing them in the flour helps to suspend your blueberries in your bread batter so they don’t all sink to the bottom of your Blueberry Lemon Bread loaf. Sift the powdered sugar for the glaze.. no one likes lumpy glaze! To make this Blueberry Lemon Bread, preheat your oven to 375 degrees, butter the bottoms and sides of a 9x5 loaf pan and set it aside. 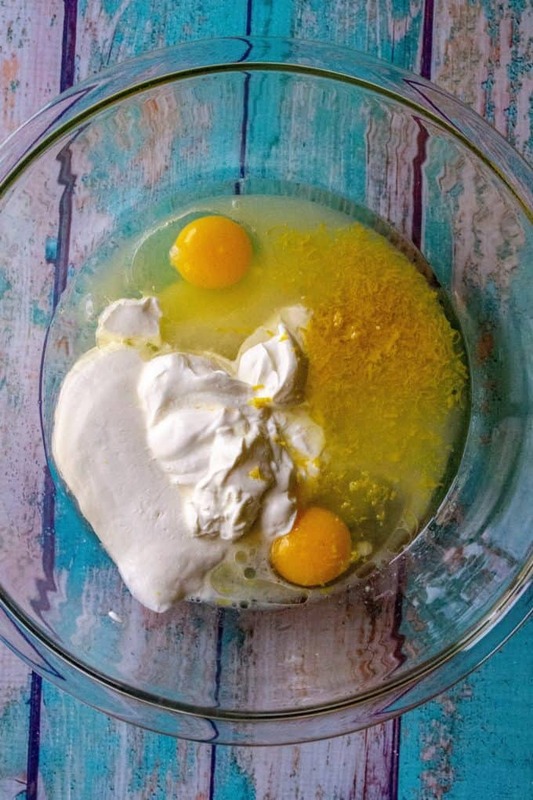 Next, add your oil, sugar, eggs, sour cream, lemon and lemon zest to a large mixing bowl and mix together. Add in your flour, baking powder and salt and mix to just combine your ingredients. 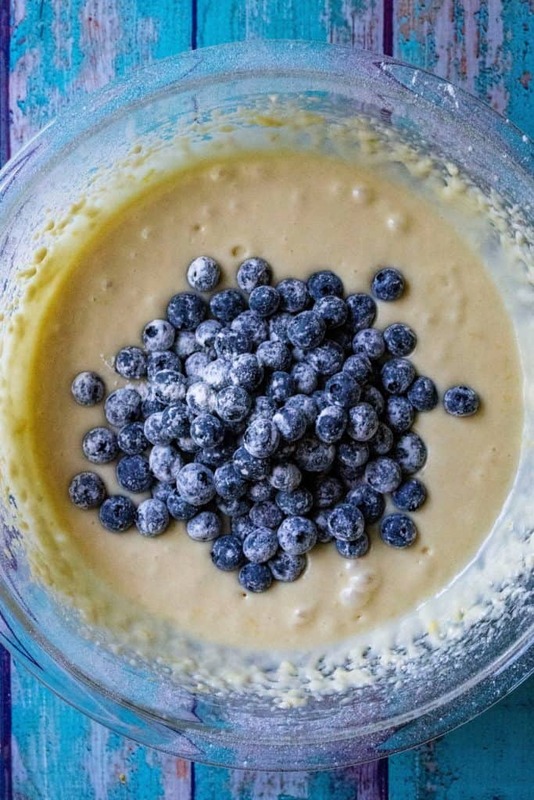 Once your batter is together, add 1-1/2 cups fresh blueberries to bowl and toss them with 2 teaspoons of flour. Add your tossed blueberries to your lemon bread batter and gently fold them into the batter. Pour your batter into your loaf pan and bake for 60-65 minutes or until you insert a toothpick into the middle and it comes out clean. Remove your Blueberry Lemon Bread from the oven and let cool in the loaf pan for 20-30 minutes. Run a sharp knife around the edges of the inside of the pan and invert your loaf onto a cutting board or plate and then flip again onto a wire rack where it can completely cool.